Payment Gateways are the intermediary between you and charging your guest's credit card. They also securely store your guest's credit card - it's not safe to just save it in booking notes! Once you've spoken to one of our team, you can proceed with these steps to complete your integration. 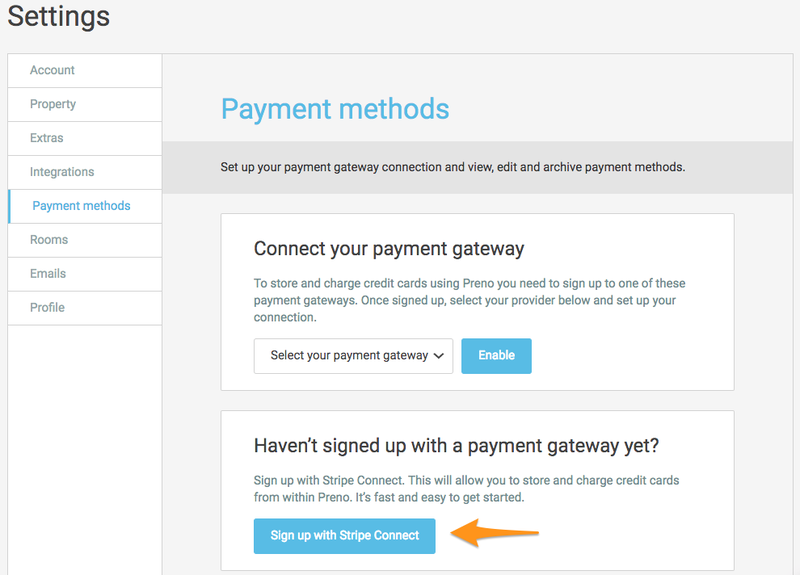 On the Payment Methods page, click 'Sign up to Stripe Connect'. If you don't have a Stripe account, then fill out the form to sign up. 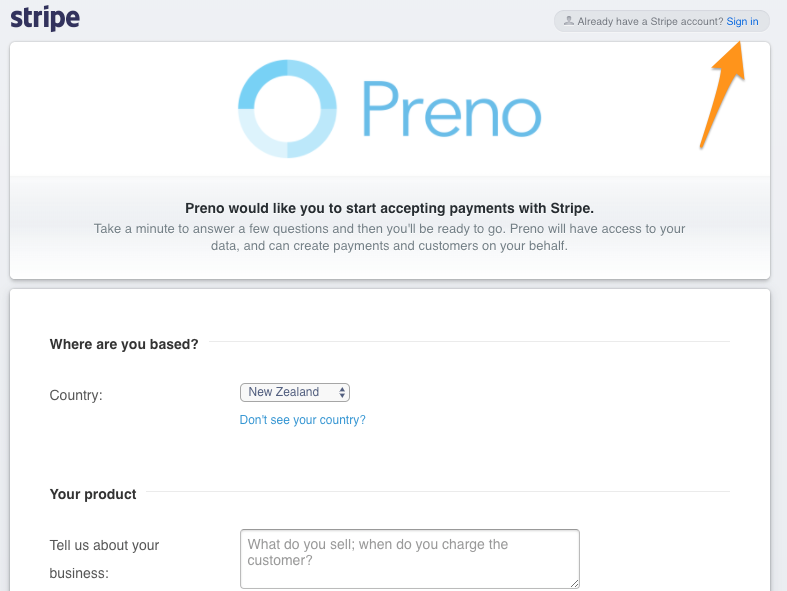 Once you complete the form, your Stripe account will automatically integrate with Preno. If you already have a Stripe account, then click on the box that says 'Sign in'. After you Sign In with your Stripe account, you may need to reach out to Stripe support so that you can charge Virtual Credit Cards (like Expedia Collect, Booking.com and Agoda). If you don't do this, then you won't be able to charge Virtual Credit Cards. Visit https://support.stripe.com/email and message their team to request that your Merchant Category Code (MCC) is changed 7011. You will receive a merchant ID, public key and a private key on your dashboard in BrainTree. Find 'BrainTree' in the drop down list and click Enable. Fill out the details in the pop-up window, and click Submit when you're done. Now that the integration is turned on, you just need to run through a test transaction. Create a test booking in Preno, and store your credit card in there. Create a $1 charge, and confirm that it successfully went through. Refund the card, and confirm that the refund is successful. Once you've done that, you'll be all ready to go! 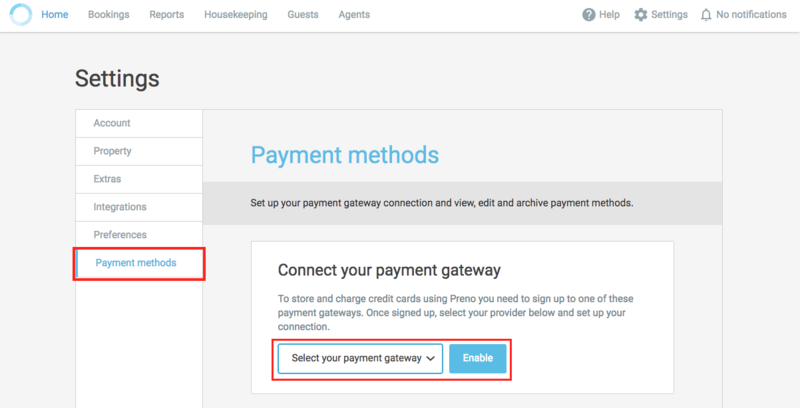 If you choose not to use a gateway, you need to be securely storing guest credit card details somewhere. Saving credit card numbers in booking notes isn't secure, and potentially opens you up to legal liability if someone gains access to your account.